Collier Hill and jockey Dean McKeown parade for the fans. 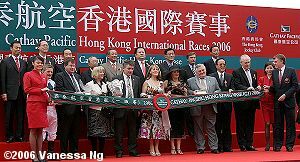 Kicking off the Cathay Pacific Hong Kong International Races on Sunday was the HK$14 million (about $1.8 million US) Hong Kong Vase (G1). 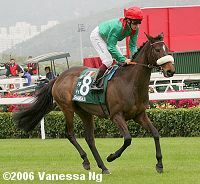 This was to be the final race in Ouija Board's career, the Lord Derby homebred who won last year's Vase as well as the 2004 and 2006 Breeders' Cup Filly and Mare Turf. 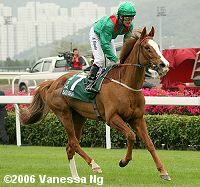 Unfortunately she was scratched the day before the race due to a recurring injury and has been retired. 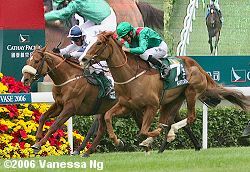 This left a field of just 9 to contest this 2400 meter (about 1 1/2 mile) event around two turns of the turf course at Sha Tin, with Japanese hope Admire Main sent off as the 6-5 favorite over fellow Japanese entrant Song of Wind at 7-2. Irish hope Scorpion was the third choice at 8-1. In the paddock while being saddled, Admire Main lost a tooth but was cleared to run by the track veterinarian. Shortly after the start with Admire Main in the lead with Saturn, Scorpion, and Collier Hill right behind. Favorite Admire Main made all the running early under regular rider Yutaka Take, through fractions of 25.60, 49.30, 1:14.00 and 1:38.50 while being stalked by 21-1 outsider Saturn and third choice Scorpion most of the way. Song of Wind was unhurried early, settling at the rear of the field just off the rail. At the top of the stretch, Admire Main was tiring badly and dropping from contention, while 11-1 Collier Hill, who had raced in mid-pack fifth most of the way around, was just getting into his best stride as jockey Dean McKeown angled him to the outside for running room. 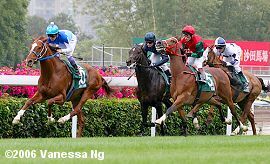 The 8-year-old gelding surged ahead to a 2 length lead with a furlong to go, but the deep closers were coming on late. 7-1 Kastoria was gaining with every stride down the center of the course, but Collier Hill held her off in the final strides to win in a photo finish by a nose, completing the distance over good-to-firm turf in 2:27.10. It was just a length back to another closer, 11-1 Shamdala, while Song of Wind was third. Admire Main finished eighth. Collier Hill in the winner's circle. Winning jockey Dean McKeown said, "I was struggling five furlongs out as they'd gone very quick but when he saw daylight he surged forward. He then started to look at the crowd 100 yards out but when Kastoria came at him he knuckled down again and stuck his head out." 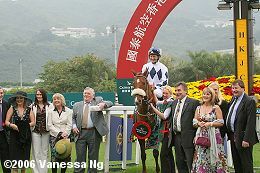 The trophy presentation ceremony for the Hong Kong Vase. One of Collier Hill's owners, Russell Hall is in the front in the gray suit. That is the same suit and tie he wore when they won the Canadian International, so I guess it is his lucky outfit. 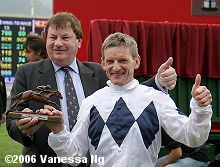 To the left, Alan Swinbank, trainer of Collier Hill and his jockey Dean McKeown give the thumbs up after the race. Swinbank said, "It was touch and go two days ago as to whether he'd run as he was dehydrated. It was only yesterday he'd come right. He's always had troubles with his joints but he's battled through his troubles. He'll go for the Sheema Classic and hopefully go one better than last year." To the right, it was a real hug fest in the winner's circle with all the owners wanting to touch him. 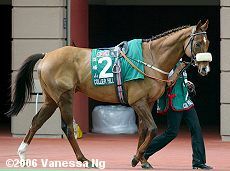 Collier Hill looks ready to go in the paddock before the race. Co-owner Russell Hall said, "I'll need a new passport if this carries on. When I first met my trainer he said he would take me round the world with this horse. We�ve done three-quarters of it already!" Second place finisher Kastoria returns after the race. 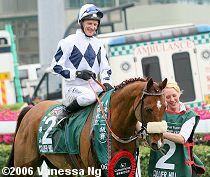 Her jockey Mick Kinane said, "I was in the perfect position behind Collier Hill but I got shut out on the turn and it cost me three or four lengths. She fairly flew home. I was unlucky." Trainer John Oxx added, "She's run a cracker. She loves fast ground and a fast pace...one more yard and we'd have got it. She wasn't at her best when she came back from Canada but she started to work well again 2 1/2 weeks ago which is why she came. She'll be covered next year but we'll talk to His Highness (owner the Aga Khan) about the Sheema Classic." Third place finisher Shamdala returns after the race. 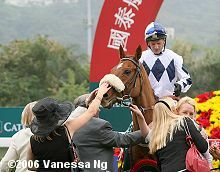 Her jockey Christophe Soumillon said, "The Japanese horse gave me a bit of a bump and it didn't help me any." Trainer Alain de Royer-Dupre added, "I was very happy with her race, I think she's run to her form and I didn't see any problems."